Hiking is available from one extreme to the other. A variety of trails and challenges range from gentle paths that meander through the lush forest floor to rugged, exhausting excursions that will test the limits of any expert. There are beautiful walking trails along Manitouwadge Lake and the newly developed Perry Lake walking trail. 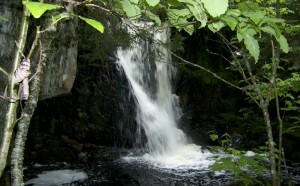 Beautiful waterfalls of varying degrees of size and speed are located just a short distance from town. High Falls, Middle Falls, and Manitou Falls are all accessible by automobile then by foot, mountain bike or canoe. All waterfalls in the area can also be reached by road. Purgatory Chutes, which are Northeast of Caramat, are accessible by automobile, foot or mountain bike.